My friends and family have been asking me to share this recipe for quite some time now. I make this pork green chili at least once a week, it’s super easy to throw together, and everyone loves it. You can easily adjust the heat of this chili, by using mild ingredients rather than the hot like I use. One batch will feed probably somewhere between 6-10 people. I use this pork green chili to smother steak burritos or eggs and hash browns for breakfast. It would be fantastic over a big plateful of fries. Pour a tablespoon of olive oil in Instant Pot and sauté pork 3-4 minutes on each side until it is brown. Turn off Instant Pot. Add in the onion, peppers, chicken broth, salsa, and taco seasoning. Place lid on Instant Pot and make sure the seal is closed. Cook on “Manual” or “Meat/Stew” mode for 40 minutes. When done, turn Instant Pot off, turn the pressure valve to release the pressure and open the lid. Mix together 2-3 tablespoons of cornstarch and 1/8 cup - 1/4 cup of water or chicken broth. Poor cornstarch mixture into green chili, hit the sauté button to help thicken the green chili. Takes a minute or two. If your chili isn’t thick enough for your liking, repeat with more cornstarch and water. Turn off Instant Pot when done. Use Pork Green Chili however you like and enjoy! Like I said, I typically use this Pork Green Chili to smother steak burritos. Here is how I make that. 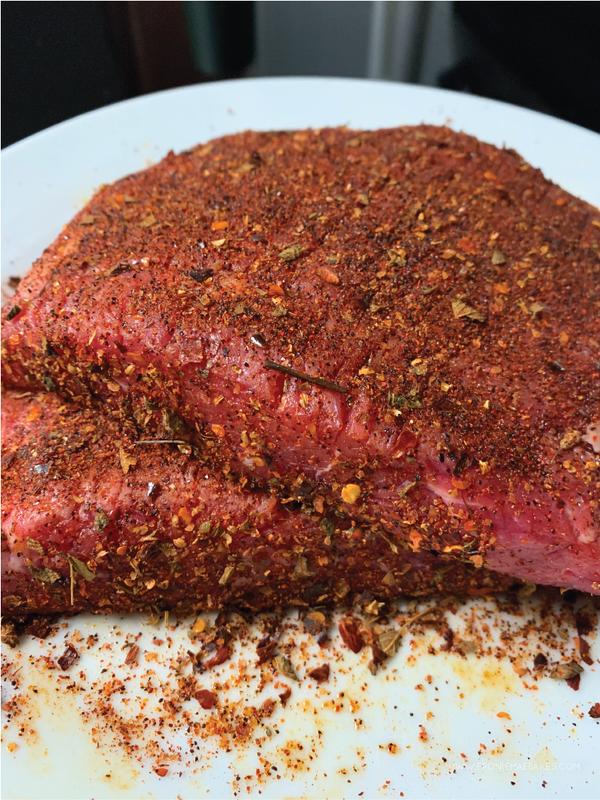 I rub 2-3 pounds of Flank Steak with olive oil, then coat it with taco seasoning. Then we throw it on the grill until it’s medium rare, then slice it up thin and throw it in the pork green chili after we have thickened it. Close up the Instant Pot and seal the valve and hit “manual” for 30 minutes. The steak comes out nice and tender and oh so tasty. 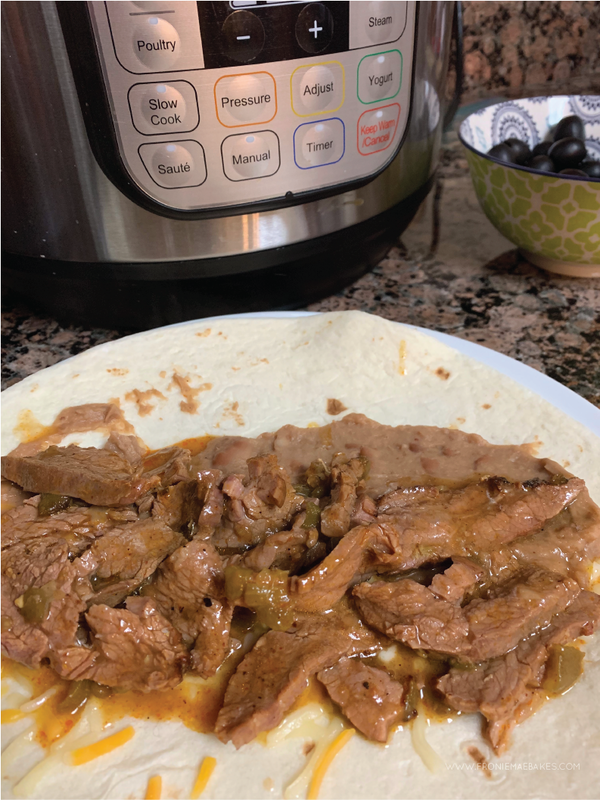 Take a flour tortilla, add some refried beans, steak, cheese and roll it up. 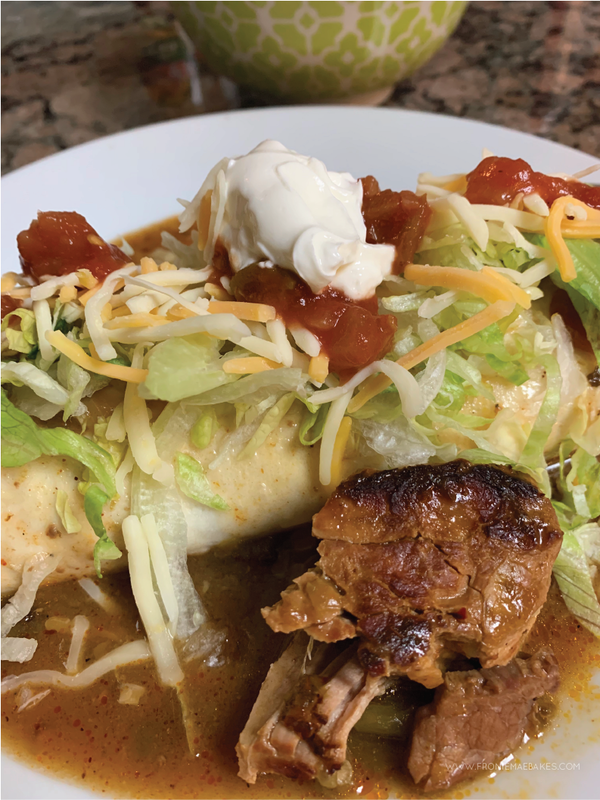 Smother burrito with Pork Green Chili, making sure to add a nice big piece of pork on the side. Top with lettuce, tomato, salsa, cheese and sour cream, OR anything you like. ENJOY!